When people think of brandy, they don't normally think of... America. This isn't to say that there aren't some amazing brandies produced here (Germain Robin for example), but America just doesn't seem as sophisticated as our friends across the pond. 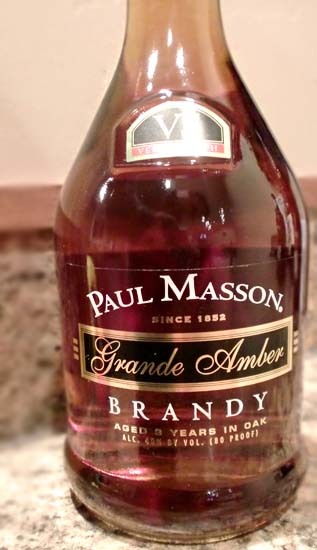 Regardless, here is an American brandy, the Paul Masson VS Grande Amber Brandy. This is what you call a budget brandy, coming in at a ridiculous $12 a bottle. It's only aged in oak for 3 years, which accounts for some of the reason why it can be sold considerably cheaper. Fair enough. Paul Masson VS Grande Amber Brandy pours a darker amber color than I would expect for a 3 year-old spirit. So, either they used smaller barrels OR they added caramel coloring. I'm guessing the latter. It smells of sweet vanilla frosting, caramel, and some vague fruitiness. Tasting brings more of that sweet vanilla, honey, maple, roasted nuts, some fruit leather, with some bitter alcohol in the finish. All in all, this was better than I was expecting. I've had $30 brandies that taste very similar. Is it as good as any of the $40-$180 brandies I've had? No. But for only $12, it's one of the better budget brandies and I can forgive them for apparently putting quite a bit of caramel coloring in it. Drink This: if you want a reasonable brandy for the incredibly cheap price ($12). Don't Drink This: if you're looking for a silky smooth, sophisticated brandy. Love to drink but hate hangover. I was recommended Detoxicated by a colleague of mine and was blown away when I didn’t have a hangover after a night of drinks. It’s seriously one of the best things you can do for yourself to feel great the day after drinking. See their website to know about what cures a hangover.